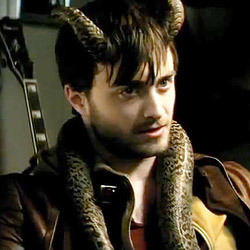 It was the more comedic approach to the last Horns trailer that finally got me on board with the idea of Daniel Radcliffe donning a set of horns, but even though the comedy is long gone in this version, the editors do manage to find a new way to make it work. This trailer highlights the film’s suspense and violence, making a convincing case that Horns could be an excellent Halloween-time option. Thanks to the romance-heavy opening, the rather vicious and unsettling trailer-ending montage and all of the interesting, engaging story details in between, the piece winds up delivering a comprehensive sense of the story with a powerful build while also suggesting Horns will be a rip-roaring, eccentric and entertaining watch, too. 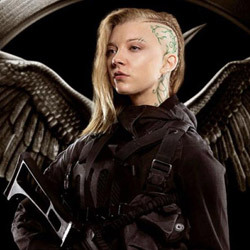 With The Hunger Games: Mockingjay – Part 1’s November 21 release date coming up, Lionsgate just released a brand new set of character posters. That last batch primarily stuck to familiar faces, like Finnick and Effie, but this time we’re getting a closer look at some of the film’s new characters, namely Katniss’ camera crew, which includes Cressida (Natalie Dormer), Pollux (Elden Henson), Messalla (Evan Ross) and Castor (Wes Chatham). We also got a poster for Katniss’ personal protector, Boggs (Mahershala Ali), and Gale, too. You can check them all out below. 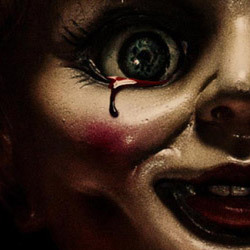 That very first teaser for Annabelle was a good one, but this full trailer goes above and beyond. 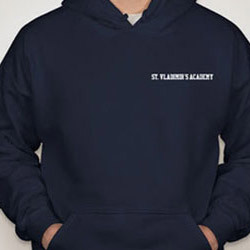 It doesn’t offer up just one good scare and call it quits. There are a bunch of very effective creepy moments and they’re all incredibly different. We’ve got director John R. Leonetti establishing an exceptionally eerie environment by utilizing all layers of his frame in one moment, and another where he toys with the audience by hinting at the bloodshed to come. Then there’s that scene at the very end of the piece where an appearance shift catches you totally off guard. This is some smart, innovative and very well-composed stuff. October 3 really can’t come soon enough. I don’t care much for the melodrama in the first half of the trailer, but after this new promo forRudderless gets past the sad stuff, it really picks up simply because the music is so good. 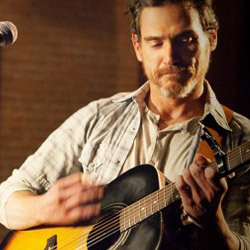 We’ve seen main characters unable to get devastating losses before and come close to self destruction because of it, but what then makes Rudderless feel like a fresh, rousing spin on the scenario is how Billy Crudup’s character winds up coping with it – through music, and music that’s catchy enough to make you want to see the full film for that alone. 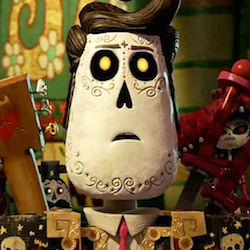 Many of my colleagues are gushing over The Book of Life, but to be honest I’m having a tough time adjusting to the style of the animation, accepting some of those very familiar romance-movie plot points and the fact that Maria looks like a Bratz doll. However, once you hit the point at which Manolo winds up in that other realm, whether you’re into his quest to win Maria’s heart or not, the mesmerizing quality of the world will pull you right in. Every single detail is so wildly fascinating that when the piece puts you back into the real world, you’ll be on board and eager for more. Not only are the releases for The Giver, The Maze Runner and The Hunger Games: Mockingjay – Part 1 fast approaching, but there’s also a slew of YA-to-film material flooding the Web courtesy of Divergent’s DVD and Blu-ray release. On top of that, the Vampire Academy series is still clamoring for attention and if it doesn’t get it this time around, perhaps the film franchise really will be dead. The producers of Vampire Academy are about to take another step towards making Frostbitehappen. We’ve already told you about their plan to get a little crowd-funding going and now it’s about to happen. Leading up to today’s launch of the Frostbite IndieGoGo campaign, the producers tried to rile up some hype by teasing the initiative over at MTV and Teen.com. Having come out of Sin City with absolutely no desire for more, it wasn’t surprising that the first two trailers for Sin City: A Dame to Kill For didn’t strike much of a chord. Both run with that same style and tone, but I couldn’t connect to it back then and that’s still the case now. However, the new red-band trailer they showed off at Comic-Con has something the other two don’t – an infectious beat. I’ve still got little to no idea what’s going in this narrative, nor do I care, but in this case that doesn’t stop the trailer from being a blast to watch. The visuals are bold and well composed, and they’re so well cut to “Babes” by Icy Blossoms that the piece winds up playing like an extremely catchy music video.